Watership Kennels-WHO'S LINE IS IT ANYWAYS? The show originated in the UK back in 1988. 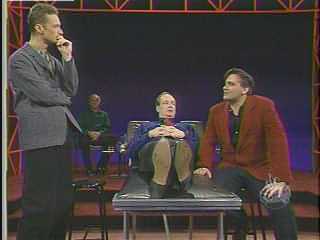 In 1998, Hat Trick started production o a USA edition of the show. The USA shows are "tamer" than the UK counterpart. Now, we are not talking crude humor. Just "edgy" enough. The Uk shows featured an array of people. Included are Canadian Colin Mochrie, USA artists Ryan Stiles, Mike McShane, Greg Proop, Brad Sherwood, and the best from the UK including Josie Lawrence, Tony Slattery, Stephen Fry, Steve Frost and many many more. For a complete list, visit Mark Longmure's exensive site. Alison's Quintessential WLiiA message Board: Where fans meet...and Collin too! Colin and Ryan....Two Tall Guys: Excellent and comical site dedicated to Colin and Ryan! Official Colin Mochre Site: Yup, it's official all right! Greg Proops Fans Page. : Great made site. Includes a "Dear Greg" Q&A from the man himself! The Lovely Brad Sherwood Site. : Lovely? You be the judge! DLIIA: DLIIA? USA Who's Line...check it out!